Los Angeles — Sustainability continues to be a watchword among individuals and communities nationwide, as climate change, food scarcity and related issues make headlines. In Los Angeles, global engineering firm BuroHappold hosts an event series for sharing ideas and contributing to solutions. 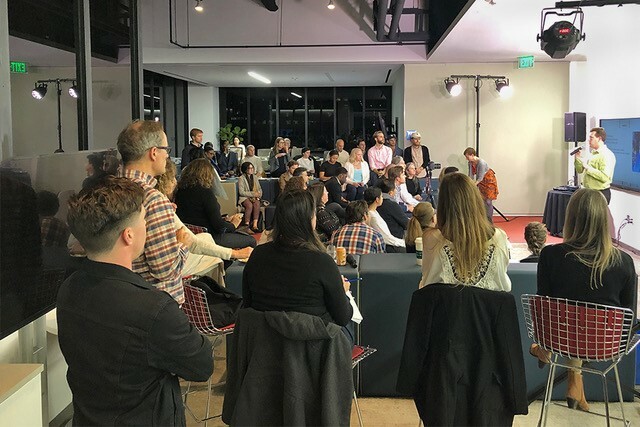 Now in its third year, BuroHappold’s “Collective Impact” speaker series invites experts and concerned citizens to the firm’s L.A. office, where they speak to attendees about their work. A dozen or more speak, for just three minutes each, on what they are doing personally or professionally to advance sustainability initiatives. The next event in the series will take place Wednesday, May 8. Several speakers on initiatives to connect people to their food systems through urban gardens, composting and more. Immediately following the lightning round of talks, BuroHappold Associate Principal Heidi Creighton and LA County Sustainability Program Director Kristen Torres Pawling led a roundtable discussion to generate ideas for taking immediate action. The ideas included attending planning commission meetings, participating in or volunteering for car-free street events through groups like CicLAvia, or even attending a school district curriculum workshop focused on careers in architecture or engineering — for those interested in making a sustained impact.